Making your way around Egypt by yourself can be stressful. 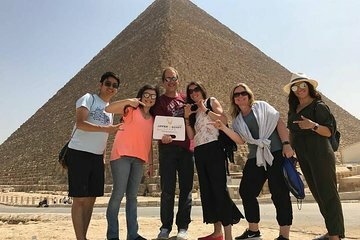 Give yourself peace of mind, by packing in visits to the Giza Pyramids, the Great Sphinx, Memphis, and Sakkara during this private tour. Along with round-trip transport from your Cairo or Giza hotel, you’ll get snacks and lunch, too. Plus, your guide is open to a flexible itinerary to make your experience the best possible.